If photographs had been taken, or video shot, last night I'm sure it would have the power to excite great nostalgia some day. The kind of ache that makes a suspicious viewer like myself think there must have been some catch to that pristine scene: horrific mosquitos, dreadful marital tension or a sad accident following the footage. But no. I killed the only mosquito before it bit anyone (yes, I guess I do kill bugs) and so far the marriage and trauma states seem pretty hunky-dory. It was simply a stunning summer evening, with lovely indirect light and cool breezes. Neighbors flocked, especially the children. Almost at the traffic jam level on the sidewalk when one kid parked his bike temporarily and the rest of the scooters, trikes and bicycles had to negotiate around it, with varying degrees of success. The five year old must have felt the moment when she insisted that she wanted her training wheels off, NOW. Wanted to ride a two-wheeler. 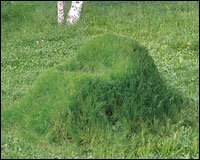 And, after about 10 minutes of instruction and falls (all onto soft grass -- she didn't add even one band-aid to her impressive collection of body art), she did. The neighbor boy, who is seven, and seems to have a crush on our nine year old, was even kind enough to demonstrate how to push down on the top pedal to get started. The five year old watched carefully. We suggested the nine year old demonstrate using the five year old's bike (the nine year old didn't have her own bike out, she was scootering). Being the obedient child, she did, despite the fact that the five year old spent the entire time jumping up and down and shrieking with the frustration of being parted from her newly two-wheeled bike. Nonetheless, somehow she got the hang of it. Ten minutes later, she challenged the neighbor boy to a race. Without success. The neighbor boy likes older women. In this case, the nine year old. We are circulating an attachment proving the major oil companies are working closely with certain politicians (as can be seen in the attached photo) to keep petrol prices at an all time high. After a year of rising prices it is the public that are now bearing the cost of the fall out in the Middle East. Do you think this is fair? Bush and Blair can be seen shaking hands with the president of BP and Texaco after a hush hush meeting. The attached article shows that Bush and Blair know that high petrol prices drives Barrel prices up-words and so in turn increases the value of stockpiled oil. This is hiding the costs of the recent and on-going troubles in the Middle East and is a ploy to keep the current Governments confidence rating high in the public eye. If you're pissed enough about that "high" government confidence rating to open the attachment, your computer gets infected. Other come-ons being used by the hackers to distribute the Trojan horse include news reports that Michael Jackson has committed suicide or that Osama Bin Laden has been killed. OK, those seem pretty bipartisan, but why aren't there any extreme righty ones? Don't the hackers think they would fall for them? After all, aren't Bush supporters just a "horde of ignoramuses"? Even for a girl, I'm kind of wimpy. When I lived in Washington D.C., in my youth, I trapped the cockroaches under glasses and left them scattered around to await my mother's (hopefully bloodthirsty) return. In New York City (living on my own) I would loudly stamp my feet before I entered the kitchen to give the insects time to scatter. I should have insisted that "I promise to kill all the icky bugs for you" be part of my beloved's marriage vows. So I don't understand, genetically, where the five year old came from. Aside from the fact that she has been nonchalantly squishing bugs since the moment her eyes became coordinated enough to focus on them, that she became fascinated with the PBS series about the French and Indian War, there's the recent matter of her chosen bedtime reading material. Or rather, her choice of our reading material, as she cannot yet read herself: Pompeii: Buried Alive. The book describes people beginning their day but "no one in the house knew something terrible was going to happen." She got it out of the library and has had us read it twice today. I think it's kind of creepy, but she is calmly interested. I never would have liked such a book at her age. Hell, I didn't make it past the tornado scene in the Wizard of Oz until after college. I admitted it already. I'm a wimp. But the five year old just re-emerged from her bedroom complaining that she's afraid she can't fall asleep tonight. Got her! Who's the wimp now? Not being able to fall asleep is definitely not something I'm afraid of. The nine year old discovered the joys of Harry Potter around Easter this year, after years of disdain due to the author's mistake in making the main protagonist a boy and therefore surely uninteresting. She rocketed through all six books and promptly began to read the whole series again from the beginning. As she sat on the couch a few hours ago, deep in Book 3, I piously intoned some slop about how while reading is great exercise for her mind, it was important to exercise her body as well and she shouldn't forget about the importance of seemingly pointless expenditures of energy, at which the five year old is so adept. (No, I do not practice what I preach). A few minutes ago, she announced that she was going to ride her bike around the block. I would crow that I'm clearly the uber-mom, except that yesterday the five year old covered the faces of all her dolls with "sunscreen," or as most folks would call it, Vaseline. 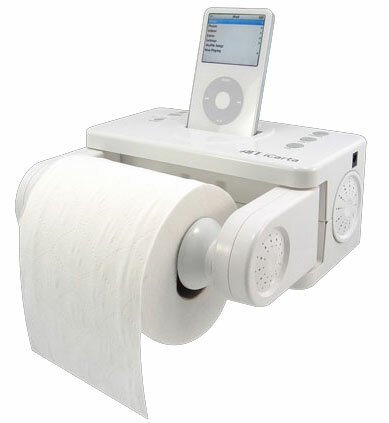 Does this mean that the iPod phenom has finally jumped the shark? 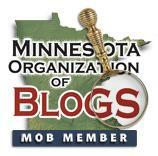 Or is it simply another nail in the coffin of the MSM -- an invasion of the last refuge of its (former) readers? 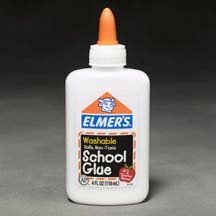 Has any child in history ever used an entire 4 ounce bottle of Elmer's glue over the course of a school year? (Dumping it all out in one go doesn't count.) The nine year old has emptied her school locker and desk out. School's out! And who was Elmer anyway? [Googling] Apparently, a bull. But not a Spitbull. 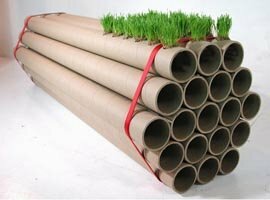 Really dumb: a biodegradable bench.